Presented to the Association in 1936. Awarded to the Top Scorer in Class A over 40 shots at 100 yards at the Staffordshire Combined Rifle Meeting. 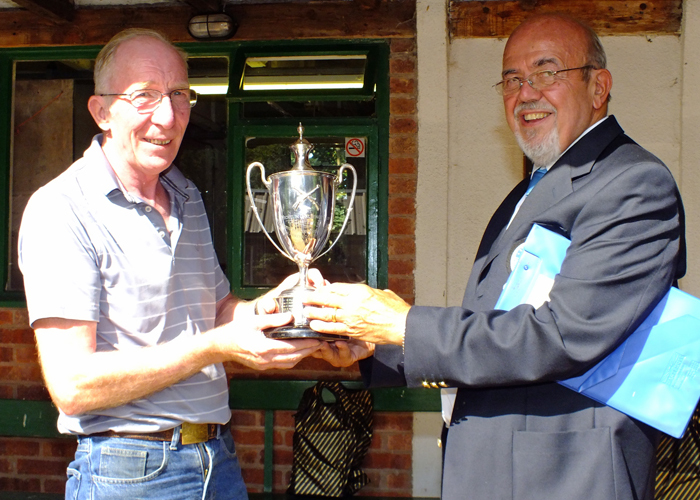 The above photograph shows SSRA Chairman - Richard Tilstone (pictured right), presenting the Michelin Cup to Steve Rowe (pictured left). The above photograph shows SSRA President - Major (Retired) Peter Martin MBE, pictured left - presenting the Michelin Cup to Steve Rowe, pictured right. 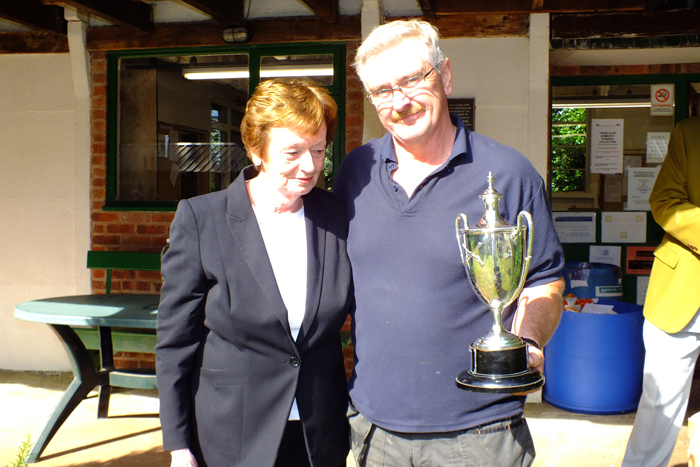 The above photograph shows Mary Jennings, pictured left, presenting the Michelin Cup to Peter Dean, pictured right. The above photograph shows B. Tonks, pictured right, receiving The Michelin Cup for 2014 from SSRA President - Major (Retired) Peter Martin, MBE. The SSRA can boast a whole array of fine trophies in their collection, of which they are always proud to present to those successful in the various competitions in which they compete. Moreover these much prized trophies can only be won by shooters who are Staffordshire residents. However, there is one exception to the above 'Staffordshire residents only' rule - and that is for those competing for The 'Come Day - Go Day' Salver, whereby those shooters need not be Staffordshire residents. The only stipulation is that they must be members of a properly constituted Rifle Club. Each trophy now has it's own dedicated webpage. 50 Metre Challenge Trophy - Awarded to the Top Scorer of 60 shots at 50 metres at the Long Range Meeting. Albert Greatrex Cup - Awarded to the Top County Badge Holder at the Long Range Meeting. 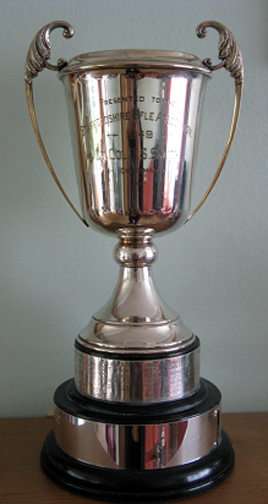 Association Cup - Awarded to the Overall Winner at the Long Range Meeting. Association Shield - Awarded to the Top Club Teams of 4 Classes 'A' and 'B' at the Long Range Meeting. Astor Tankard - Awarded to the Winning Club Team of 6 Shooters at the Staffordshire Combined Rifle Meeting. 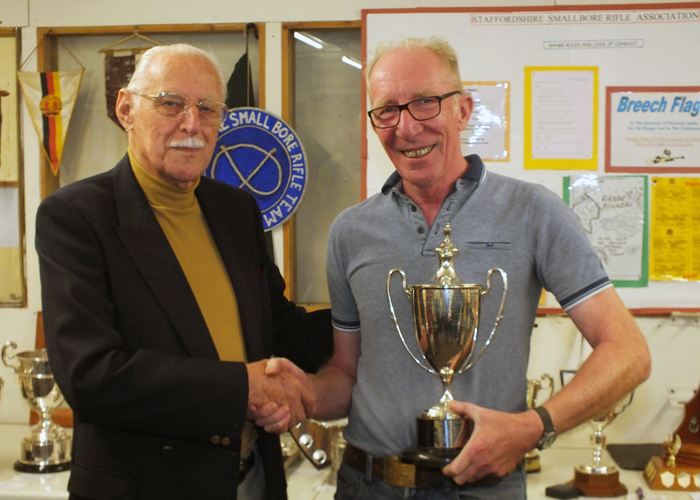 Cliff Everall Memorial Cup - Awarded to the Top Junior at the Short Range Meeting. Col. N.C. Joseph Cup for Marksmanship - Awarded to the Top Lady at the Short Range Championship. 'Come Day-Go Day' Salver - Awarded to the Overall Winner of the Long Range Meeting. E.J. Chipperfield Trophy - Awarded to the Winner of 'D' Class at the Long Range Meeting. 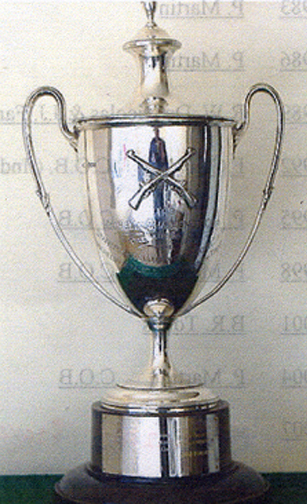 F.G. Troke Rose Bowl - Awarded to the Champion of Champions entry at Bisley. James Beattie Tray - Awarded to the Top Lady at the Long Range Meeting. K. Madeley Rose Bowl - Awarded to the Top Veteran at the Long Range Meeting. Michelin Cup - Awarded to the Top 'A' Class at 100 yards at the Long Range Meeting. Michelin Shield - Awarded to the Winning Club Team of 4 in Classes 'C' and 'D' at the Staffordshire Combined Rifle Meeting. Miniature Rifle Challenge Cup - Awarded to the Winner of 'A' Class at the Long Range Meeting. Moat Cup - Awarded to the Winner of 'C' Class at the Long Range Meeting. Mrs. C. Everall Cup - Awarded to the Top Junior at the Staffordshire Combined Rifle Meeting - Long Range, aged 21 or under on the 31st of December in the year in which the competition is held. Pidduck Shield - Awarded to the Top Team of 5 in the postal stage of Short Range Championship. R.W. De Nicolas Memorial Trophy - Awarded to the Top Shooter in Classes 'C', 'D' or 'Junior' Aggregate comprising 80 shots at the Staffordshire Combined Rifle Meeting. Smith Cup - Awarded to the Top Shooter at the Short Range Championship. Stafford and District Club Secretaries Trophy - (No photograph available.) Awarded to the Top Club Secretary at the Short Range Championship. Stafford Plaque - Awarded to the Best Shooter at 100 yards in Classes 'B', 'C' or 'D' at the Long Range Meeting. Swynnerton Cup - Awarded to the Winner of 'B' Class at the Long Range Meeting. 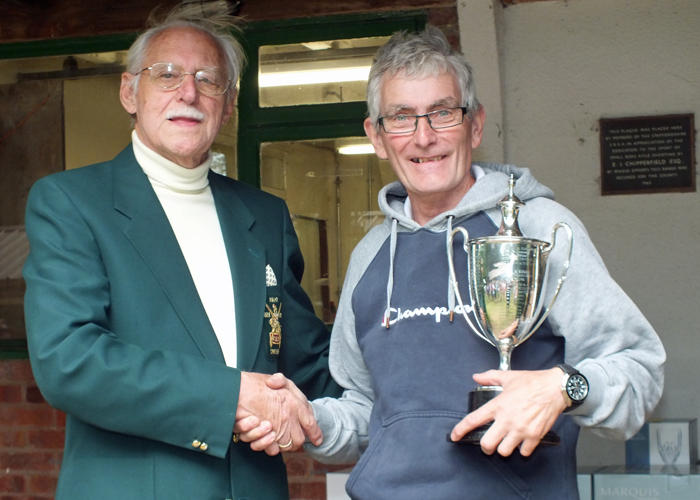 Veterans Short Range Championship Tankard - Awarded to the Top Veteran at the Short Range Championship. Walsall Cup - Awarded to the Winners of the Winter Indoor Short Range League - Division 2. Weatherall Shield - Awarded to the Best Team in Divisions 'C' and 'D' of the Winter Short Range League. Wedgwood Cup - Awarded to the Winning Team in Division 1 of the Staffordshire Short Range Winter League. Whitmore Cup - Awarded to the Top Lady in Classes 'C' and 'D' at the Long Range Meeting. Wilkinson Sword - Awarded to an Individual nominated by their club or discipline organiser. The recipient being decided by the Staffordshire Smallbore Rifle Association. Wooden Spoon - Awarded to an individual who is nominated by their club or discipline organiser, for any 'unfortunate misdemeanour' - nothing too serious, honestly. If there was a category in shooting for 'Out-Takes' or 'Bloopers' then this award would belong in that category.